What an odd little film "Shallow Hal" be. Despite their own physical limitations, Hal and best bud Jason Alexander (with a hairpiece) seek only the most physically-perfect, movie-star gorgeous women at local dance clubs etc. Jason even disregards a potential "hottie" based on unusual toe size. Their obsession with perfection guarantees depression. Into this hopeless cycle, drops psychological seminarist Anthony J. Robbins, "I didn't hypnotize him - I de-hypnotized him!" Robbins gives Hal the ability to see right through the flesh to the heart and soul of women around him. So, no matter their "real" physical appearances, Hal will "see" golden-hearted women (and men) as handsome/ravishing people on the outside as well. Of course, Hal's friends don't perceive things the same way. The first ten to fifteen minutes (save for the opening sequence) are rather stiff, awkward, and slightly off the mark, but after Hal meets Robbins (a very good scene) the film itself seems to be hypnotized toward success as well. 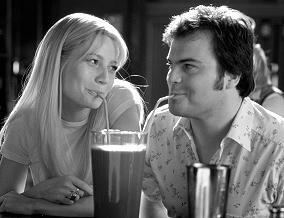 Jack Black (in his first lead role) performs well while Gwyneth does a great job of making us believe that she believes she's not gorgeous. (Loved the flat-liner title credit and crew shots at end as well.) A strong B+, "What Women Want" sort of flick. Btw, impressed with Robbins' absolutely convincing role as the hypnotist/mind-guru, I read up on him in the press notes: "Anthony J. Robbins (as himself) is the nation's foremost authority on the psychology of peak performance and personal, professional and organizational turnaround - an identity he has established through his ability to consistently help individuals and organizations create measurable results over the last twenty years." Hal: "If you can see it and smell it and feel it, who's to say it's not real?" Shallow Hal. Copyright © 2001. Rated PG-13. Starring Jack Black, Gwyneth Paltrow, Jason Alexander, Joe Viterelli, Susan Ward, Anthony J. Robbins. Directed by Bobby and Peter Farrelly. Written by Sean Moynihan & Bobby and Peter Farrelly. Produced by Bradley Thomas, Charles B. Wessler and Bobby and Peter Farrelly at 20th Fox.